Northern America. British, Russian & Danish Possessions In North America. 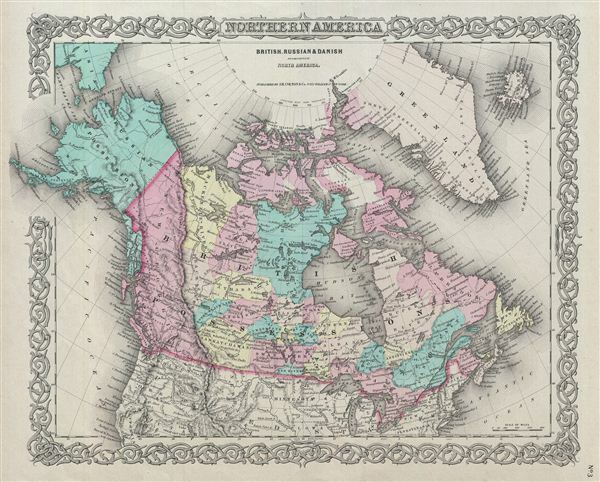 A beautiful 1855 first edition first state example of Colton's map of modern day Canada, or more specifically, British, Russian, and Danish holdings in North America. Like most of Colton's North America maps, this map was derived from an earlier wall map of North America produced by Colton and D. Griffing Johnson. The map covers the continent from modern day Alaska (Russian America) to Greenland (Danish America), and from the U.S border north to the Arctic, including Iceland. According to the earliest written accounts, the Russians were the first Europeans who reached Alaska and eventually became permanent settlers. The modern Canadian provinces and territories were under British and French control from the 16th century, until France gave up its claims in the Treaty of Paris in 1763. Canada would remain a collection of British colonies until its confederation in 1867, when the British colonies of Ontario, Quebec, New Brunswick and Nova Scotia would become Canadian provinces. This map also identifies various forts, rivers, mountain passes, fords, and an assortment of additional topographical details. Map is hand colored in pink, green, yellow and blue pastels to define state and territorial boundaries. Surrounded by Colton's typical spiral motif border. Dated and copyrighted to J. H. Colton, 1855. Published from Colton's 172 William Street Office in New York City. Issued as page no. 3 in volume 1 of Colton's 1856 Atlas of the World. Rumsey 0149.012 (1856 edition). Phillips (Atlases) 816.